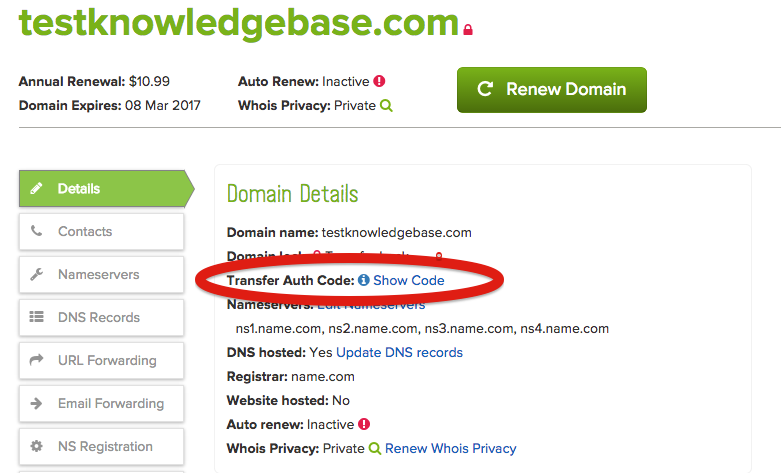 In the Domain Details section, you will see Transfer Auth Code. Click Show Code to find the auth code for your domain name. Why does my Auth Code say "Unavailable"? The auth code will not show within the first 60 days of registration. ICANN, the group that regulates the distribution of domain names, has a very strict rule that domain names cannot be transferred to another registrar within 60 days of the date they were registered or transferred to a new registrar. This is done to prevent fraud. Unfortunately, since this is an ICANN rule, not a Name.com rule, there is no way we can remove the 60-day hold. If you have had the domain for 60 days or more, and the auth code is still showing as unavailable, send an email to support@name.com and we will be happy to assist you. Note: You don't use the auth code when internally transferring a domain name to another Name.com account. Instead, you will need the account code.